IMterrupt controls and blocks access to Instant Messaging and peer to peer services that put your family at risk from internet hazards. Free trial version available - sets up in less than a minute. 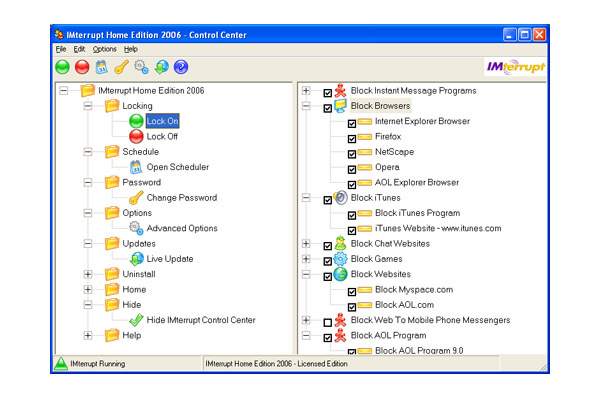 Blocks all popular services: MSN Messenger, Yahoo Messenger, ICQ, AIM, Skype, eMule, iTunes, and many more. Also controls web browsing. IMterrupt is continually updated to detect and block new programs as they are released. Easy setup and admin. ...... home from internet chatting, exchanging songs online, or browsing the web. IMterrupt can also provide defense against internet predators by restricting chat and IM use. Or if you just want your kids to get their homework done and participate in healthy play, and not waste all of their time chatting online, IMterrupt can help. Say good-bye to the risks, stress and hassles of uncontrolled internet usage with IMterrupt Home Edition, a new product from Comvigo, Inc., an internet security company. Qweas is providing links to IMterrupt Home Version 2.5 as a courtesy, and makes no representations regarding IMterrupt Home Version or any other applications or any information related thereto. Any questions, complaints or claims regarding this application IMterrupt Home Version 2.5 must be directed to the appropriate software vendor. You may click the publisher link of IMterrupt Home Version on the top of this page to get more details about the vendor.